It is wrong to call Ikorodu a town these days with its population which keeps growing at an incredible rate and its rapid development. 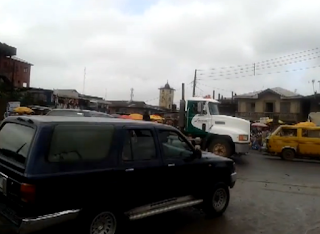 It is not an overstatement that at least 2 million people live in Ikorodu and its outskirts. Sabo is the largest bus stop in Ikorodu and by extension, it is one of the most important bus stops in Lagos. Ojota is the touching ground for many first-time visitors to Lagos. The overwhelming majority of interstate buses pass through it with many having it as their final bus stop. It is also a major park for buses heading out of Lagos. Hence, do not be surprised if motor park touts lift you and your belongings towards a bus of unknown destination if you drop at Ojota with what even remotely looks like a traveling bag especially if you are a lady! They can be that aggressive as they assume everybody stopping at Ojota with a bag is heading outside Lagos, it doesn't matter to them that you might be heading to the West while the bus they are loading is heading to the East. It is up to you to defend yourself- surprised? Don't be, welcome to Lagos! Lagos is a heavily-populated city and fewer parts of it are more populous than the areas that Mile 2 serves as a major terminus. From Mile 2 Estate, Festac Town,, Satellite Town, Trade Fair Complex, Ojo Town and Barracks, Lagos State University, Alaba International market, Okokomaiko, Ajangbadi, Ijanikin, Agbara all the way to Badagry and Seme border into Benin Republic. I have not yet mentioned Apapa with its port and Tin Can Island. Mile 2 serves as the intersection of Lagos-Badagry and Apapa Oshodi Express way which are 2 major roads in Lagos. 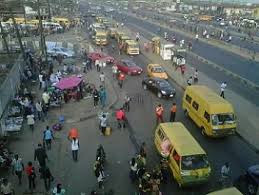 Like Oshodi, it has Mile 2 Oke (Upper Mile 2) and Mile 2 Isale (Lower Mile 2). Mile 2 is essentially the bridge that vehicles coming from or heading to Apapa take to by-pass Lagos-Badagry Expressway. There are 3 bridges linking the Island to the Mainland in Lagos: Eko bridge, 3rd Mainland bridge and Carter bridge. Of the three, Carter bridge is the oldest and at a point was the only bridge linking the Island to the Mainland. 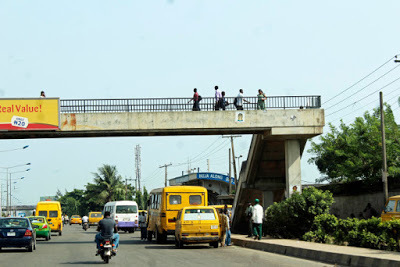 At the Lagos Island end of Carter bridge is Idumota bus stop. It extends, right from the bridge all along Nnamdi Azikwe into the old bus terminus just before the iconic Lagos Central Mosque. Idumota is as popular as a market as it is as a bus stop. Clothes, electronics, latest Nollywood movies, consumables, car spare parts and accessories. Practically any consumer goods you can think-of can be found there. I am tempted to start with the lyrics to Wizkid's song 'Ojuelegba' about this very popular bus stop but that might not be fair to one of the most iconic locations in Lagos. Ojuelegba is in the middle of the old Lagos Mainland Local Government. On one side of it is Surulere on the other is Yaba, the 2 major districts that make Lagos Mainland with close proximity to Western Avenue (now Funsho Williams Avenue) and Eko bridge., Ojuelegba is ever-bubbling and busy. Iyana Ipaja is the biggest bus stop along the Alimosho axis of Lagos. 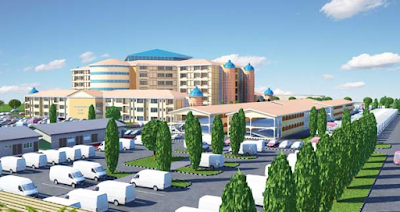 Strategically located on the Lagos-Abeokuta Express Way, it serves as a hub for commuters getting out of places like Abeokuta, Ifo, Sango-Ota in Ogun state Alagbado, Alakuko, Abule Egba and many more heading towards Ikeja, Lagos Island and beyond. Perhaps the secret of Iyana Ipaja's popularity is the fact that it has proximity to several heavily populated areas within Alimosho Local Government Area, like Igando, Ikotun, Egbeda, Idimu and others extending to Ogun state. This means it is ever-busy with road-side sellers, street traders, buses and private cars all seeking to sell or make their towards their different destinations. Ikeja is the political capital of Lagos which in turn is the commercial nerve centre of not only Nigeria but the whole of West Africa. 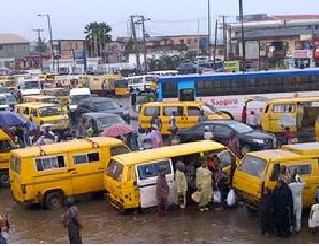 This fact by itself is not the major reason Ikeja is a major bus stop in Lagos. Ikeja bus stop is quite big because it extends from Old Ikeja terminus to Underbridge, Ikeja-Along to Ikeja-Inside. You could argue that these are different bus stops but as is the case with Oshodi, Mushin, Obalende and other major bus terminuses in Lagos, they are a combination of smaller bus stops under one umbrella. Strategically placed between Lagos Island and Ikoyi is one of the most popular bus stops in Lagos- Obalende. The name Obalende when literally translated to English from Yoruba means 'The king chased me to this point '. Who the king and the person being chased were is not the subject of this post. I will be looking at Obalende as a major transportation hub in Lagos. It is one of the major gateways into what is now referred to as 'The Island ', a term used to describe the the most important and influential districts in Lagos outside of its capital on the mainland, Ikeja. These are Lagos Island, Ikoyi, Victoria Island and Lekki. It is a major terminus for buses coming from the mainland to the Island via the 3rd Mainland Bridge which is Africa's longest bridge, 11.8km long. This strategic location makes Obalende one of the most important transportation hubs in Lagos where you can find buses to practically every location in the city. 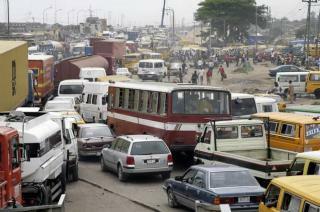 Many people from outside Lagos coming to trade enter the Island via Obalende. 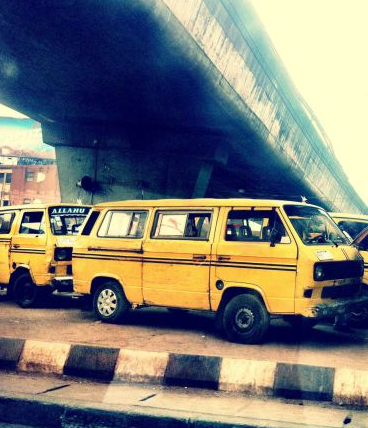 Hence, there are many interstate buses especially to other cities in Southern Nigeria. 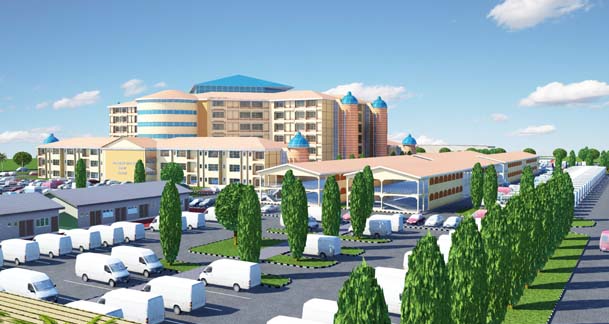 It has a sprawling underbridge bus park which also serves as a market. And it's time for No.1! You can tell, I am excited... which bus stop do you think it is? Let's find out! Does this picture give you a clue? 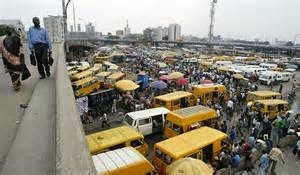 Lagos, the Centre of Excellence and undisputed commercial hub of West Africa is always alive with the hustle and bustle of its people as well as visitors. However, amongst the popular locations within the city, there is an elite division of must know and see places particularly bus stops. Having been born and lived in Lagos virtually all my life except for the enforced absence for a year during national youth service, I feel qualified to do a review of the most popular bus stops in the city starting with Oshodi. Oshodi is perhaps the most popular bus stop in Nigeria, it seems to enjoy its popularity because of its relative centrality to most parts of Lagos like the Island, other parts of the Mainland and heavily populated areas like Alimosho and Ikorodu. It is also an intersection between the busy Apapa-Oshodi Express Way, Gbagada Express Way and Agege Motor Road. It is divided loosely into: Oshodi Oke (Upper Oshodi) and Oshodi Isale (Lower Oshodi). You can get a bus to almost every part of Lagos at Oshodi and there are also many Interstate buses heading to the Southwest, North and Southeast. 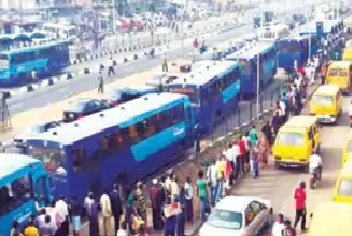 Truth be told though other bus stops like Ojota and Jibowu in Yaba beat Oshodi as a terminus for Interstate buses. 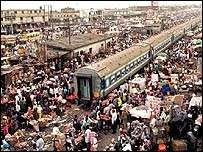 However, Oshodi is also a major train station and it used to have its notorious "Oju-Irin" market in the past where the railway was transformed into a marketplace that disappeared when a train was approaching to reemerge after it had left the station. There you have it folks! 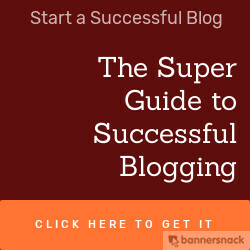 What do you think of this list, do let me know by dropping a comment and let's discuss.